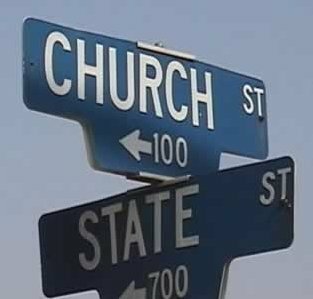 Some will respond by saying that Christian morals should be excluded because they are religious and that violates the separation of church and state. But the words, “separation of church and state” are neither in the Declaration of Independence nor the Constitution. Even the First Amendment protects religious expression, it doesn’t silence it: “Congress shall make no law respecting an establishment of religion, or prohibiting the free exercise thereof; or abridging the freedom of speech…” Notice who and what is restricted: the government is restricted from establishing a state religion. The people, however, are free to exercise their religious beliefs. Not only that, but it would also mean that if an ordinary American was against theft because the New Testament (Ephesians 4:28) forbade it, then they wouldn’t be permitted to legislate against larceny. Every person with a religious view would have to remain silent on public policy. This would disenfranchise massive portions of United States population. Very well said! We often take tremendous heat over this issue. Which is why strength will eventually win over truth, and the democratic republic will turn into a totalitarian regieme. The question is, which one? The tyranny of the many will overrule the convictions of the few. As our culture becomes increasingly post-Christian, our voices will be silenced and it will be the new, American way. I’m not looking forward to that, but I expect it. Does that mean might makes right? Will we use the same tactics that the LGBT movement is when we are the minority? Which laws do we legislate from the Bible? All moral laws? Would that include adultery, fornication? And what should be the punishment or restriction? Don’t mean to play the devils advocate because I really have been struggling with this question! If you don’t play the devil’s advocate, we’ll never fully comprehend the issue. It’s a necessary part of thinking it through. We are not a theocracy, and liberty for all is guaranteed – including those we disagree with, although the early state laws did have death penalty for things like adultery and homosexuality. Do we want to go back to that, or do we want (as Christians) to persuade rather than coerce? I don’t think the way our national government is set up (Constitutionally) that we have the right to force clean and moral living on others, but when a crime is committed (and that is the state’s juristiction, not the federal government), there should be a just and reasonable consequence. I think following the Biblical law for homosexuality (OT days) is not lawful, or reasonable for America, where religious freedom is permitted, and expression of various viewpoints encouraged. However, it is true that homosexual behavior and Christian morality cannot peacefully coincide. Neither can Islam and Christianity. Someone will force their morality on someone else, and that’s why I say our days of freedom are numbered. Christian morality cannot peacefully coincide with homosexality or Islam? Tell that to Christianity’s founder… too often do we forget morality isn’t a mere set of rules. That was the mosaic law. We don’t keep the Ten Commandments anymore. Now we are under the Law of Love–a better, more complete law. We do the commandments because we love. We SHOULD have peace with all because we are under the Law of Love. Homosexuality and Islam are not the problems. We are. Individually. Do we really think Jesus would have a problem with a Muslim or Homosexual? Or would He say: “What are you doing tomorrow, can you invite me to your Mosque/House?” We don’t need to defend morality. Let morality do its job, which is defending the people! We have it backwards. Apologetics is not a sword. It is a shield. Not an offensive weapon, a defensive one. To nurture the unknowing/unrealized conscious. We do not give enough credit to reality. Strength will win over truth? This is akin to saying a lie will turn true. It is saying Ultimate Reality will be toppled by a non-powerful entity. It is not going to happen. It is an illusion. Yes, trials are coming our way. And this is the truth (not the strength, doesn’t fit well does it? ), but so what? Truth is always the victor because it is the only thing that is there, our very ground that we walk upon. If the USA turns totalitarian we have no reason to worry. It can be compared to a kid taking another kids sand box since because his broke. It is no worry to Ultimate Reality/God. A plan is already underway, God deals with His children all the time. He knows us. I believe anyone asking this question isn’t asking if it is legal for Christians to impose their moral standards. I think the person posing the question wants insight. Why is imposing a Christian moral standard on marriage through the legal process a good idea? From a Christian point of view, what does it achieve? Is the creation of laws (that are consistent with the morality set forth in the Bible) a clear or implied mandate from God?